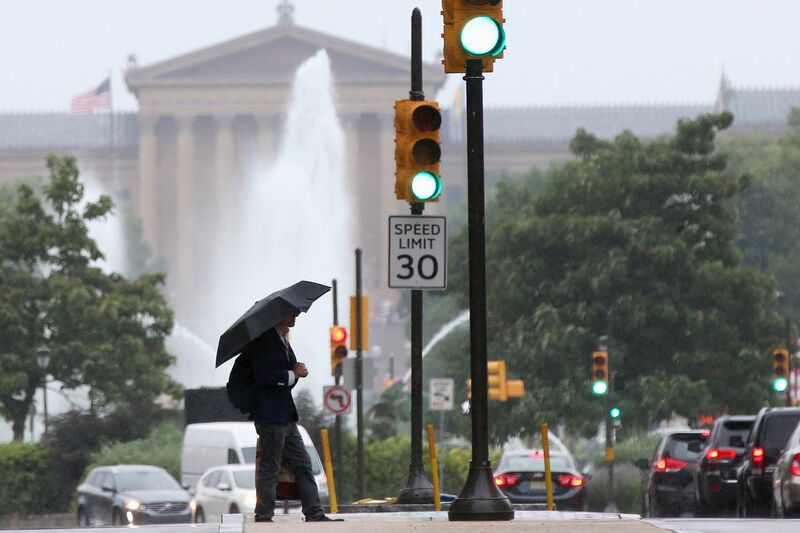 Fitful, staccato downpours have been dousing parts of the region again Tuesday, flood watches remain in effect west of the Delaware River until 6 a.m. Thursday. The targeted areas Tuesday have been to the west of I-95 along the region's "fall line," said Alex Staarman, a meteorologist with the National Weather Service in Mount Holly. That's the subtly elevated area, just a few miles wide, which extends from the Carolinas to New England where the Atlantic Coastal plain begins to rise toward the Appalachians. The slight slope can give an extra lift to rising, vapor-laden air that condenses and falls as rain. Tuesday's rainfall "is not necessarily isolated, but not everyone is going to get a lot of rain," Staarman said. But that will change on Wednesday: "It looks like things are going to start shifting farther east," he said. Plus, the heavy rainfall is likely to be more widespread, thus the flood watches "will probably be extended." With the afternoon update, the weather service has added most of New Jersey to the watch areas. The updated flood-watch area now includes most of New Jersey. The week-long sog-a-thon is related to complex masses of juicy systems and high pressure off the Atlantic Coast, the kind that often bakes the region and sets off heat waves. This one, however, is blocking the moisture-bearing systems, although its western flank has provided a measure of protection to areas from I-95 east. In the last week, for example, about an inch of rain has been measured at Philadelphia International Airport, and over 4 inches in Chester County. Fortunately, said Staarman, the rains have arrived after a generally dry period, thus the streams and rivers were at low levels, but that also is changing, and continued rains are going to cause some to flirt with flood stage, the weather service says. One area to watch is the Schuylkill in the Norristown area, which is forecast to approach flood state Thursday morning. More showers are possible Thursday and Friday. But, don't look now, but the forecast for Saturday is sunny.